BERLIN (Reuters) - German authorities banned two media organisations it said are linked to the banned Kurdistan Workers party (PKK), considered a terrorist organisation by the European Union and Turkey, after raids early on Tuesday. Police searched the Mesopotamia Publishing House and MIR Multimedia in the western states of North Rhine-Westphalia and Lower Saxony and seized material, the interior ministry said. "As the PKK is still active despite being banned in Germany, it is necessary to rein in the PKK and uphold our legal system," Interior Minister Horst Seehofer said. Earnings from the two organisations are funnelled exclusively to the PKK and strengthen its capabilities in Germany, the ministry said, adding the two organisations go "under the guise" of publishing houses. With about 14,500 supporters, the PKK is the biggest radical foreign organisation in Germany, which is a base for recruitment and refinancing. 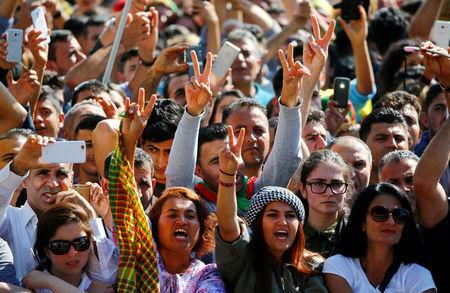 Relations between Germany, home to some three million people with a Turkish background including many Kurds, have improved in the last few months after serious tensions over the arrests of German citizens in Turkey and a crackdown on dissent in Ankara after a 2016 failed coup.